Granbury has been featured on a number of large media platforms thanks to the hard work by Mary Lester, of MPL Public Relations, who earns Granbury media placements through her relationships with industry producers and publications. 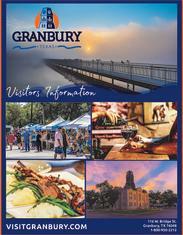 There are additional digital platforms that have featured Granbury including articles, event listings, and more. Check out some of the highlighted features below! Parade Magazine - "5 Fabulous Places For Empty-Nesters to Explore"
USA Today - "Drive-In Movie Theaters in Almost Every State"
Texas Monthly - "Texas Beer is the Best Beer"
Only In Your State - "This Small U.S. Town Has One Of The Best Wine Festivals In The Entire U.S."
Southern Living - "10 Must-Visit Spots in Granbury, Texas"
Texas Highways - "The Inn on Lake Granbury Offers a Tranquil Waterfront Getaway"
CNN Travel - "Top July 4 Events Across the United States"
That Texas Couple - "20 Texas Christmas Destinations You Won&apos;t Want to Miss"
Fort Worth Weekly - "On Tap in Fort Worth: Cowtown Brewing Updates"
Mama Challenge - "Girlfriend Getaway in Granbury"
Dallas Morning News - "Do Happy Cows Make Great Cheese?" Guidelive/Dallas Morning News - "General Granbury&apos;s Birthday Shindig and Bean Cook-off"
DFW Child - "27 Hidden Nature Gems in Dallas Fort Worth"